What Makes A Magic Garden? I ran a workshop with this title at the International Permaculture Convergence in 2015 (IPC 15). ​What makes a special place? Can a magic garden be designed at created on part of an allotment plot of 8m by 8m? 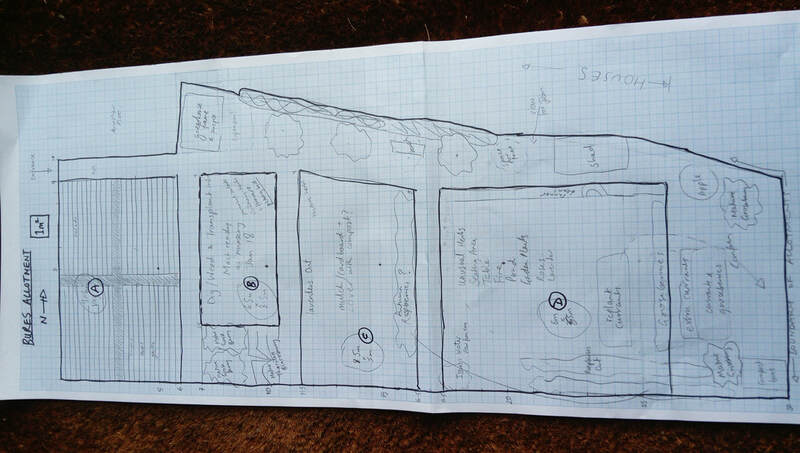 A smaller garden design within the new allotment (Design 11) based on the learnings from the workshop. I have chosen the SADIM design method as there is a vast amount of getting to the crux of this design which I can only think to put into the SURVEY section of SADIM. This design is a land based and a non land based design - the word magic will be like marmite to many......love or hate..... bear with me on this please. See the webpage http://chagraculture.weebly.com This is an idea I have wanted to explore for a long time. Inspired from Rainforest indigenous places to educate the next generation in spiritual aspects of nature. I also really want to encourage you to read the English version of Lulu's permaculture article in the German Permakultur magazine (n.b. Not the British Tutor but similar name). She came to my workshop at the International Permaculture Gathering 2015 in London where we looked at a patch of grass. The key outcome was the word nook and term nookification. 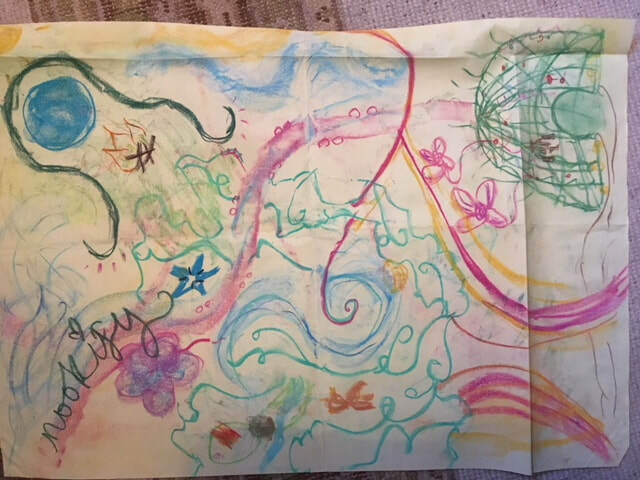 I treasure the colouring pastel notes we made at the IPC 15 workshop. It meant something to us at the time and now I take the nook concept, shelter, elements, flow, colours, shapes and plants. DESIGN AIM: What makes a garden magic? or What makes a Magic Garden? 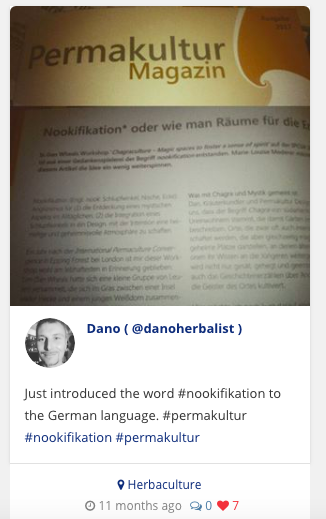 The IPC15 workshop and the German permaculture article led to the word Nookification being a chief way to make a magic garden........ all our thoughts fixated on this idea. Nook: a small corner or a hidden place. The origin of the word denotes a hook or angle. Cranny: It just sounds rude. 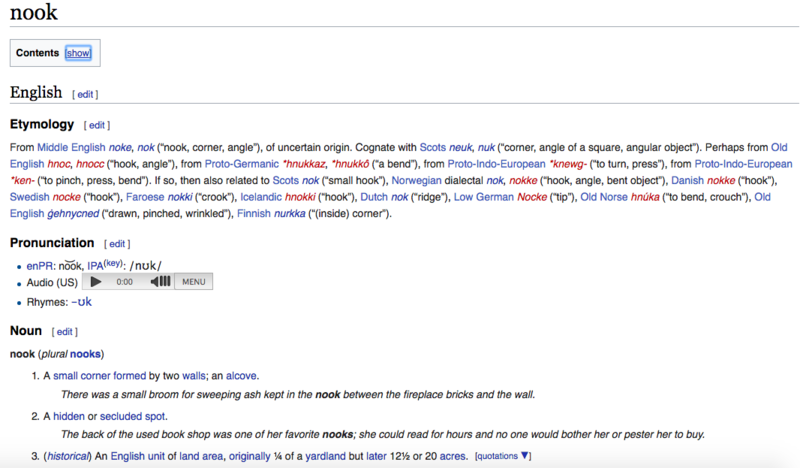 A small, narrow opening, fissure, crevice, or chink, as in a wall and it seems to be a newer word from Norman (French times). Lets stick to Nook. What do other people think makes a magic garden? Workshop feedback & answers from several gardeners and garden loving friends. It has a feeling and sense of something. feeling - sense and tune in to the presence of power. "the nature of a person's experience of a sacred site may be influenced by them having what Devereux calls a "multi-mode" approach to the sites, that is, by experiencing the sites from the vantage points of both knowing and feeling, both mind and heart. Knowing means having an understanding of such matters as the mythology, archaeology, history, geology and (possible) celestial orientation of a site. Feeling means the ability to sense and tune into the presence of power at a site." Recognise the magnetic spot of an intimate space. Everything is scared. Longing needs to meet Belonging. "Yet what makes a space in nature sacred only begins with its wild beauty or biodiversity, he adds. “Contemporary religious studies scholars would generally say that whether a religion’s sacred space is a built or a natural environment, it’s human activity that consecrates those places and makes them sacred.”"
Someone wrote a book about it: "Family Gardens: How to Create Magical Spaces for All Ages" - see amazon. I asking friends who are particularly good at making places wonderful for parties there is a sense of proportion and "done with love". Flowers that sing rather that bent leaves swashed into vases. Bunting that drapes with ease and with gardens space for the plant to thrive. I HAVE A SPECIFIC 8m by 8m space so lets START AGAIN With a more conventional START to This DESIGN PROCESS of SURVEY. 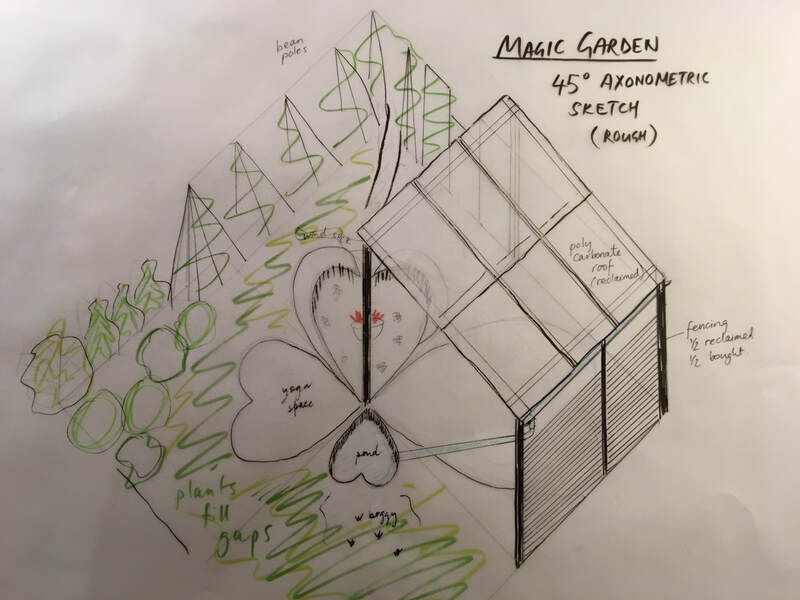 Following on from the previous design about my new allotment, I had the chance to think about this specific area and trial my design and my thoughts. The Basemap sketches from DESIGN 11. The allotment base map above with patch D on the right. What am I wanting to achieve with this design? I need to ask the client - myself ! How does the client feel about the current arrangements? ​Its a blank slate. I don't just want produce from my allotment so its a chance to be imaginative. It is near two houses as on the edge of the allotments so that needs to be thought about. What are the clients needs and wants? I want a place of spirit and a chance to practice creating such spaces. 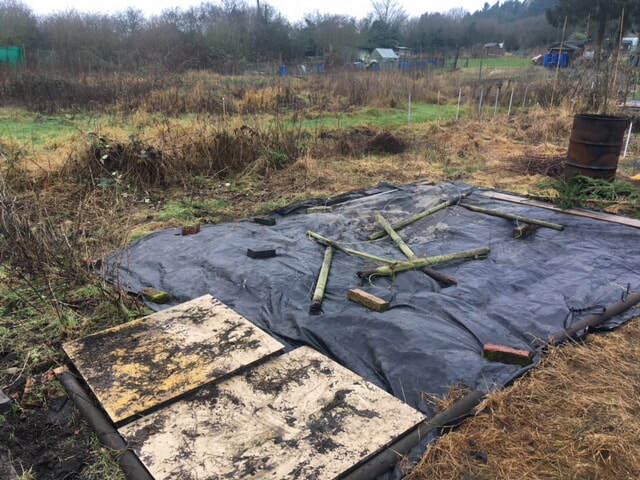 I want to use this larger section of my allotment for all the other requirements I have.... social space, cooking, fire, chill space, my plants that I have been growing, an example of a magical garden. a special place. What are the clients values and vision? I want it all, plants, nooks and crannies, magicalness however that is achieved and a social space. It has to unfurl and design itself, have space for the wild. It has to be inspirational. I want to entertain, cook, take naps, meditate and surprise myself. What are the personal limiting factors? What personal resources do they have? I am committed to this small garden. It is about the size of the herb spiral in design 2. It is replicable, It is the last design in my portfolio, it connects up many ideas like chagraculture and IPG 15 workshop and what got me into permaculture (nature). So I can commit a lot to this including that I want a social space, I want my plants to thrive and It feeds my interest in design. What is their financial budget for this design? Considering the last answer I could plough money into this. But the magic will be built up with creative tweaks and recycling of rubbish. There is not limit except that its more fun to get there slowly. the site gets sun all day, in all seasons being south facing. Only water is from self collected sources. No existing infrastructure or services or access paths. The allotment site is privately owned by the church and is very relaxed about what you do on it. What is the timescale for the design? 2018 but hopefully evolving every year Im living here. S ADIM. What makes a magic garden? /Getting to the crux of things that make designs more 'magic'. Have I learnt anything? In trying to taking all these factors into account, I see that we can try to weave magic into a place so my design is going to have to be woven mindfully allowing nooks to form, being mindful of principles and patterns and incorporating elements and life into the design. Specific: How can I actually know if something is magic or not? Hard to be specific here. I have got three headings elements, nooks and life as an attempt to specify what I mean. Measurable: Again this is a hard one to quantify 'magic'. I can measure what I have come up with by what garden blueprint conclusions I can come up with. I could also measure how well I and others just sit and feel in the garden (using the magic garden as a place of meditation). Achievable: have the garden designed, created and in use. Relevant: Designing a magic garden and creating a blueprint for future gardens also helps with relevance. SMART ACTION 1: Have a party (Set date) to celebrate with those interested in the garden..... other herbalists, apprentices, friends, transition folk, open gardens? and allotment holders..... Or just me and my partner...... Ask everyone to evaluate my magic ideas and give feedback. Have a magic theme and ask for things to be brought to the garden or run an activity to make things to hide in it. Make it a diploma presentation party! 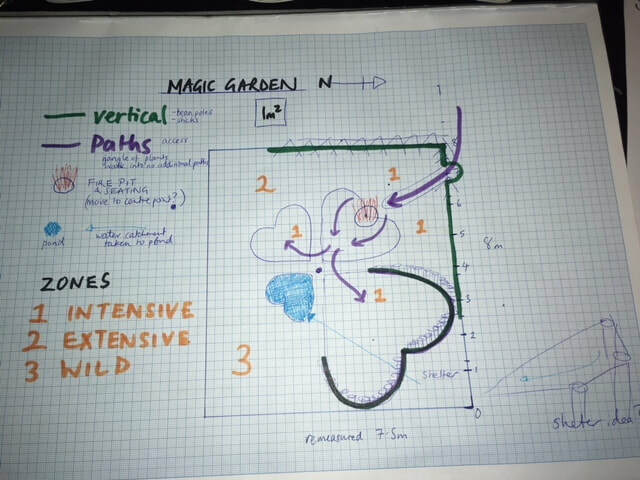 SMART ACTION 2: Come up with a replicable design for a magic garden. People Care: This relates to wellbeing. My own personal wellbeing but also a journey I am taking in trying to work out what makes good human scale design to feel right- to feel magic. Earth Care: Part of the magic is a nod towards a philosophy of earth appreciation and a sense of connection between people and earth can only increase our awareness and need for good earth care practices. Fair Share: The power and magic is about sharing it. If a garden design blueprint can be freely downloaded, shared on pintrest etc then why not help to inspire others. There is a symmetry that I am trying to achieve with this online portfolio as well which is accessible to all and in return I ask that you tell me your thoughts and learnings as well. CAN I SAY YES TO THIS DESIGN? IS THERE ANY POINT IN DESIGNING THE MAGIC GARDEN? A massive YES! Although I am not being paid to to this as a job I love the concept of the garden forfilling many needs for me. 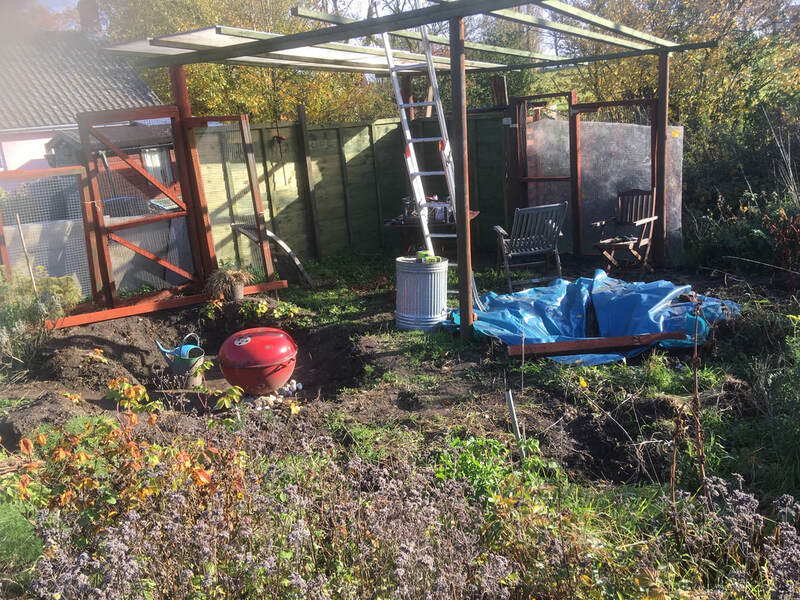 I get a magic place to rejuvenate, the creative juices flowing, a catch all last space on my allotment for plants, entertaining etc and maybe it will lead to future design work. Also it fits in with a design that could fit a back garden client brief. Plants, socialising, wildlife and creating a sense of place. I can see it will help me with ideas for small gardens too. 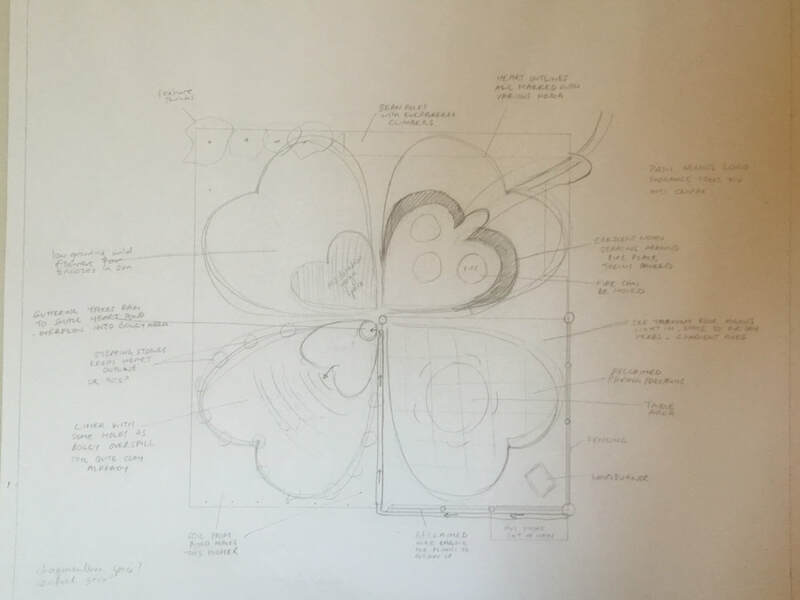 In this final design I am very keen to incorporate the learnings I have gathered from Writtle College Garden Design evening classes. I will still use design tools and have included the processes of drawing that I had before I went to college. I wish to use the technical drawing knowledge I have learnt to create a more professional vibe to the drawings. Please see the two sections PRE and POST COLLEGE. PLANTS: Primarily my Old Hall Plants that are unusual herbs or plants that I have loved. Having worked in a plant centre there are many. They can have functions other than edible and medicinal... i.e. I love them. Encouraging some wild plants to colonise possibly. I love the moss that I found, and this site has a natural head start with spreading of plants e.g the raspberries will look very wild as they have spread over 3 years to look native. ANIMALS: None intended but none barred. If having a pond then this can attract small animals, insects and birds, I will not fence off the area but I do hope it is a bit hidden from other allotmenteers. There was talk of deer on site occasionally...not sure I want deer here. STRUCTURES: I want a screen from the rest of the alltoment, I want a rain shelter so I can be there in all weathers. I want a range of heights to the plants. Fire barrel, cooking area, pond etc Some construction will take place. TOOLS: Think of the usage of the site and I want a lot out of it. cooking, food, shelter, rest, calm, space to sit with others. Otherwise I hope tool use is limited to a bit of removing any thugs from romping over other plants. ​EVENTS: Crucial use of the space. Teaching, relaxing, cooking, entertaining and meditating. ​Increase the magic with a positive Spiral of Less Intervention. (not sure who to reference this to). Permaculture supports the idea of "the Spiral of Intervention". This concept addresses the theme that nature should run its course and that minimal human intervention is best course of action. Encourage wildlife in and the resulting spread of plants arrive. ​removal of limiting factors. I can just keep an eye on things, remove the bramble and nettle and perhaps the raspberries if they get out of control. Actively encourage magic but composting, mulching with any clippings, cycling the nutrients. Hopefully the design will encourage this to happen as naturally as possible. DESIGN: how to represent my ideas? Design my functions into the design and know that I am meeting my design aims especially AIM 2: Make a magic garden with this learning? enclosure fedge gooseberry, rasberrry, beanpoles and fence. 5th element? add spirit meditation space? display plants pots create a display area with labelling. Others involved share ideas / concept videos / party. SEE CAPITAL INSERTS FOR DESIGN IDEAS. magic'ness​ nooks lots of little hidden places, sculpture and beauty. Decision on hearts made after trying a few shapes. 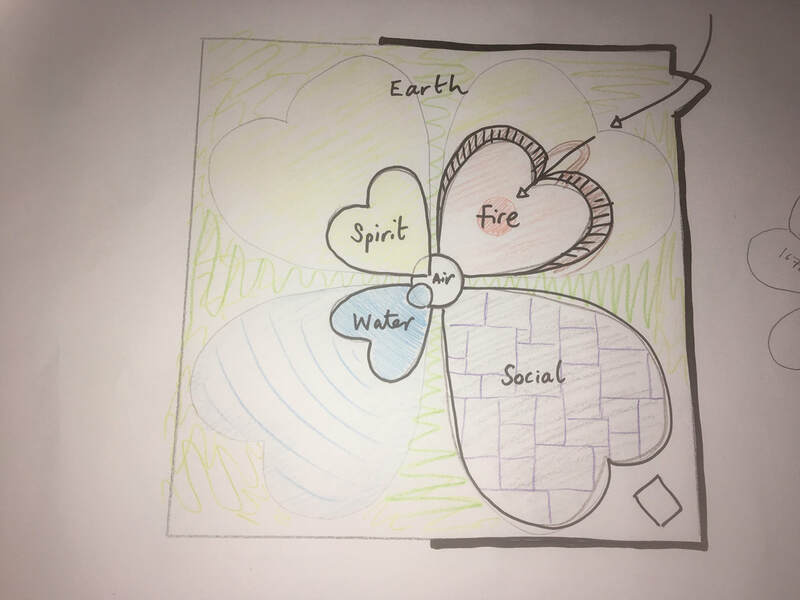 I had explored some of the other shapes in past designs but the idea that clinched it for me was the four elements and the four heart as a sort of zoning. I concluded that the Ethics and Principles were what makes a garden 'magic'. For intense nookification pack as many ethics and principles in and then add some more. Primary PC Ethics combine to create a herbal display allotment with magical venue for trainees. PC Principles come to the fore at different times, Using what I have, valuing, observing, letting the wild in and taking out only what is surplus. The PC Ethics and Principles written on the fence remind me to do everything with awareness. It is an ongoing process guided by permaculture. Composting is magic, seeds growing is magic and a good design is magic. Sharing ones love of herbs is also magic. ZONING: How do subdivisions affect the areas? I can use the hearts as four distinct areas or zones. There is also the area outside them too. EARTH, AIR, FIRE, WATER, SPIRIT/ ETHER. I started with an initial sketch below. THIS GOT CONFUSING BUT I HAD A GO. Pond doesn't want to be big so I placed it on the smaller heart. Other elements of fire opposite to the water..... however this is also the entrance heart so the fire might be more suited to the cooking and social space? the larger heart is idea for the more functional social space for cooking, table and chairs. If shelter is needed then the blank square behind the larger heart could be the shed/shelter which also stops a structure from shading the garden. Also a herb drying area could fit the wind element in the structure? Earth is everywhere else so the final element of Ether or wind could be a meditation space seems fitting. My initial sketch about the herbaculture hearts... I love it. 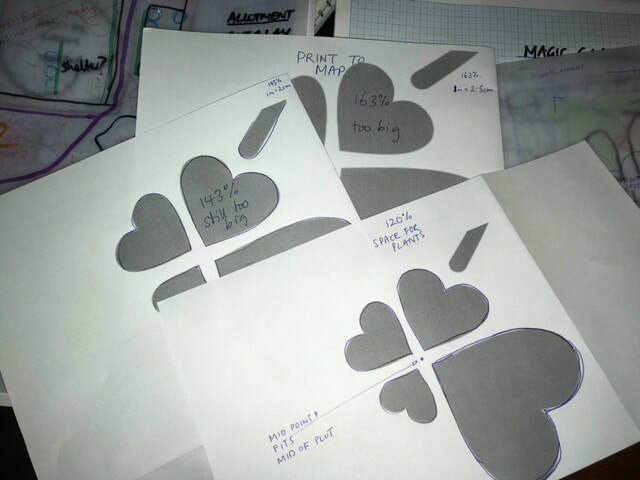 Above shows the resizing of my logo to trace the hearts onto a scale drawing to assist marking out. Also on the right, the section from design 11. Note I am using the ZONE 1 2 and 3 for this area. There will be intensively looked after pots and specific special plants, areas left to get on with it and hoping to have wild areas as much as possible ( giving plants space to thrive). Shadier but only slightly in the bottom part of the area. I think the shade cast from plants will be more of an issue. ​Below: Checking on site if it seems to work. Pond area perfect. Bean screen perfect and sweet pea and mange tout planned. . Moved raspberries to create some enclosure. Gooseberries creating more edge. Replant old knarled lavender. Spirit area is mediation area with ornament graveyard. Social area to have cooking, eating table, shelter and wooden edging of the heart. Pots for extra growing possible. red is existing, light blue was dug up, purple moved or added and green proposed. Zones. The paths are just in the hearts and its step into the jungle outside the hearts. This shows the plants in the area with respect to the hearts (note the medication space has plants in it. 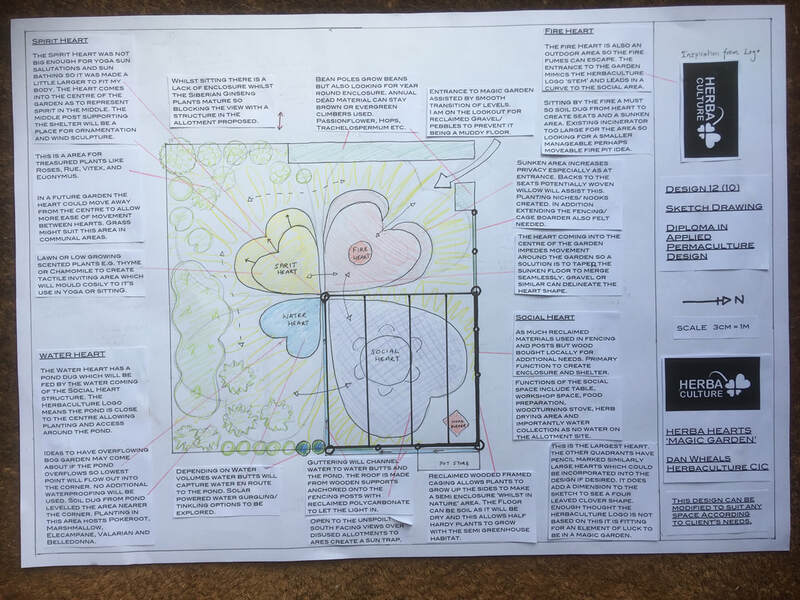 Using the above design tools and now adding the skills I have learnt at an evening class in Garden Design, the next section will be a more professional approach to design. The Bubble diagram just starts off the design process. A really quick relational representation of the area. Having made some decisions about the use of the areas already it has helped to progress onto adding the functional details. With the additional knowledge that I have constructed certain bits of the shelter already I can add this detail in at this stage. I also learn to record a site using a baseline and triangulate measurements to work out the outline of a space. I knew that this garden is exactly 8m by 8m as I created it that way when in Design 11, I created the areas on the allotment. So I can leave out the specific plants at the moment and concentrate on the finer design details in the hearts. The second heart outlined plan shows the relationship of the elemental aspects of the garden a bit clearer. In this part of the design details I am going from Pattern to Details. Using pencil to be able to change anything I work on each quarter of the drawing and find solutions to anything that comes up. Does it matter which way the gradient goes for the shelter roof? Creating Nooks? How do I keep the heart shapes in the design? What materials? 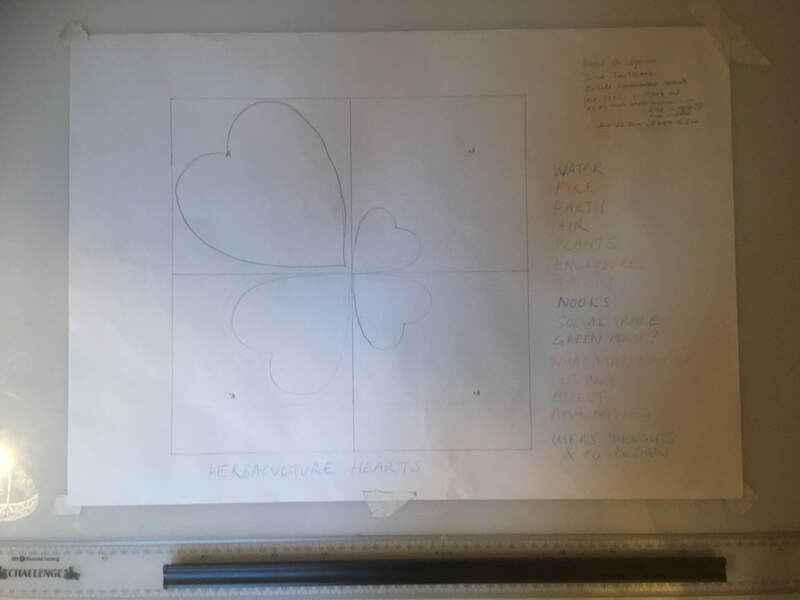 I have drawn the large heart in each quarter to get an idea of proportion and as in the pond quarter it can define the edges of og the boggy area to give a sense of harmony. I know that at this stage I need to be flexible and that general ideas are enough to see it through. It may change when I come to reality but at least I will know what I am aiming to achieve. 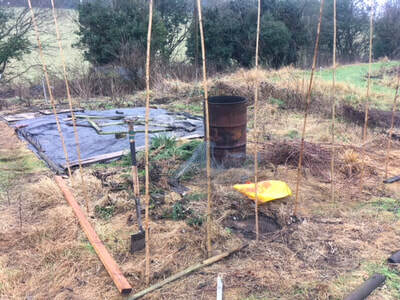 I learnt from the last design (New Allotment (11) that I can therefore plan and make sure there is method to the chaos. The ideas is that the Sketch Diagram is then suitable to show to a client. This would be the time that discussions about final placing and the chance to get client go ahead. Exact planting less important than rough height to plants and general feel. This allows the client some further input. Once the area was marked out and design ideas formed. It felt great to move plants and know where to put things. 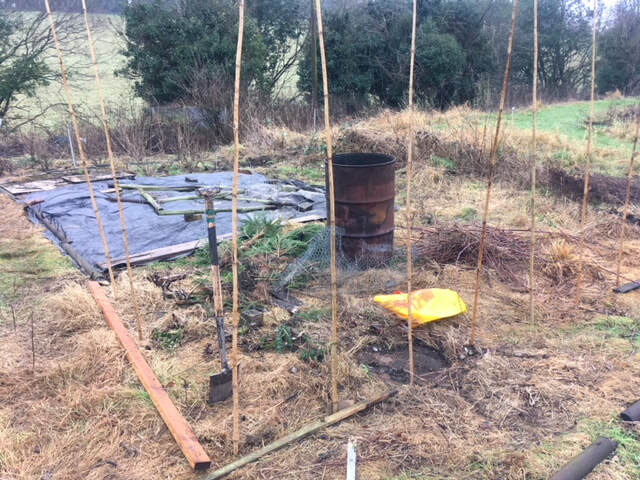 I bought some bamboo poles which when up felt good as they enclosed the area from the rest of the allotments. I moved the fire barrel and the xmas tree and the choppings can all be burnt. The pond placement looked fine to me and the edge with brambles and old raspberries chopped back. an old tarp helped to weed suppress. With raspberries from else where moved the site will be near ready to receive plants from my previous house and garden. plant it up from Old Hall plants.... as much that works before February. Below helped measure out from the drawing into actuality. The heart is not standard to measure. Zone in by right clicking or using your method on you device. Method for placement: Special plants get top spots. Others get heeled in waiting return from holidays. All summer I have been doing bits and bobs - mainly harvesting produce. Photo of roof going up below. Mock Accreditation Time. I will talk about my portfolio and video it in the garden. Please note this will include better final footage of the garden. The design and maintenance of a magic space needs time, additions and tweaks. More design work on the nooks and crannies, the planting up of the various herbs and the design and building of the shelter/ cooking areas. I need to involve others too so invite them in to help. elements - fire water wind earth - Wind sock, flag or schulpture in time. shelter - rain no barrier to being there , it fills the pond up. danger (or protected from but close to danger) spikes plants and toxic plants. Mirroring of the macrocosm/ microcosm - proportions. Sculpture to reflect this? Forbidden - wild places no go areas. It has a feeling and sense of something. do people go wow! Nature interacts - pond and bird table? already animal paths visible. where edges meet! lots of edges. ​naturally occurring geology different textures? space to thrive - do things in it. In short, turn up and tune in. Did I meet the design aims? AIM 2: Make a magic garden with this learning? 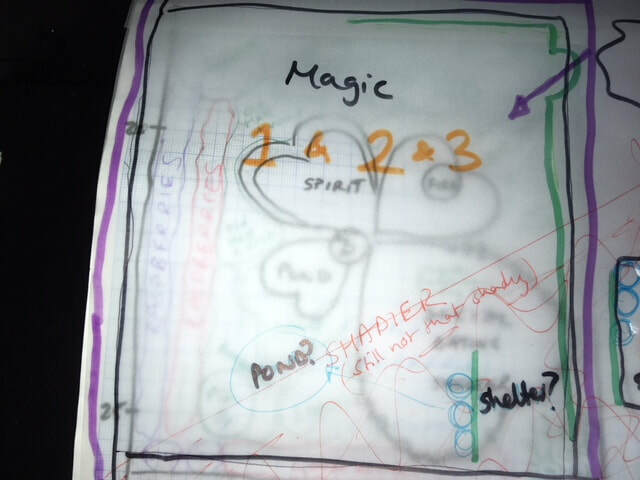 AIM 3: Revise my ideas on what makes a garden magic in light of the design. AIM 4: Can I have a blueprint for designing future Magic gardens? ​AIM 1: Learn what makes a garden magic? I got closer to knowing.... would I tell if I did? I think part of this quest is lifelong and sitting in my little garden I will ponder more on this. I realised that nooks are like niches. It has been fun to adopt a pro nook policy. I realise that the herbaculture hearts makes an extra special meaning or magic to me but this is not for everyone perhaps. It relates to the individual but there are other garden design concepts that perhaps are important like not seeing the whole area all at once. I will need to spend a bit more time in the garden to evaluate this more fully. Also to see what maintenance I have to do and in light of that, what improvements are needed on designing magic. It is certainly the place I gravitate towards on the allotment and I bunk off work to go there. Now the magic belongs to the plants which can thrive. You'll have to commission a design to get a feel for my blueprint. See below for ideas. ​SMART ACTION 1: Have a party (Set date) to celebrate with those interested in the garden..... other herbalists, apprentices, friends, transition folk, open gardens? and allotment holders..... Or just me and my partner...... Ask everyone to evaluate my magic ideas and give feedback. Have a magic theme and ask for things to be brought to the garden or run an activity to make things to hide in it. Make it a diploma presentation party! It could even video it to share online. I will aim for a December Solstice party with hot drinks. That I have ideas for but it feels like the placing of objects depends so much on location and client. 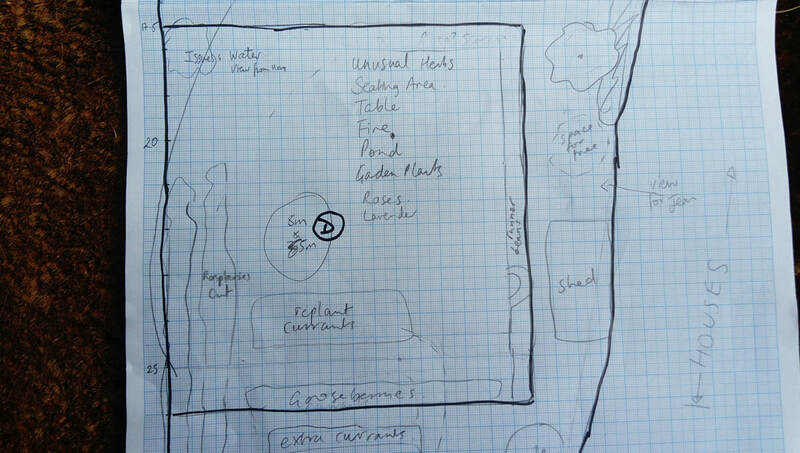 I have in my head an ideal GP Herbaculture Garden based on the magic garden ideas. ..... Exciting stuff. I felt important to use these last two designs in the portfolio to practice land based permaculture basic tools. I really much prefer the SADIM to OBREDIMET as it is more free or loose. However I think that it is always worth considering everything that can help not loose sight of the aims. I like to mix OBREDIMET AND SADIMET to get new persepectives. but ultimately I like the word Survey as it is broader and thus more useful. It has been really useful to go to college for an evening class to get more presentational skills in technical drawing. I will be using these skills to make myself more professional as I can be a little slap dash. There is an interesting cross over in garden design and permaculture and I realise I am still relying on ideas popping out of my head rather than just using design tools and methods. I now have learnt to have a plan and use it to keep on track. Allotment or Business Admin, having a plan is a genius idea. As the last of the designs, Do I feel ready to be a permaculture designer? on a walk today I saw a garden with a massive slope which is really rare where I live and I thought about all these methods I have learnt about for designing on a larger scale and getting gradients for water courses. I know my limitations andI feel I have just started. I am not going to be a massive scale landscape designer (yet) but I can come up with ideas and formulate them enough to go forth an market myself with confidence. I also think I would like to find a partner in design that would be more hands on with hard landscaping so I could focus on the clients and plants. Its half about interest and half about the investment on tools and being up for it. I am really chuffed to have been on two 10 evening blocks of garden design training as it has really made a difference to my drawing and although I still find it hard to be super neat I am nearer to that goal. I do still have the goal to use Sketch up or a similar digital tool so as to be flexible in styles. I have insurance with Herbaculture CIC to do designs for people so I am ready to start charging. Back to to The herbaconsultancy design to polish that up with a real paid job. This process never ends but the diploma has helped me get where I am. CAN I MAKE A SELLABLE DESIGN TO MAKE A MAGIC GARDEN? I just can't create one design to fit all solutions. 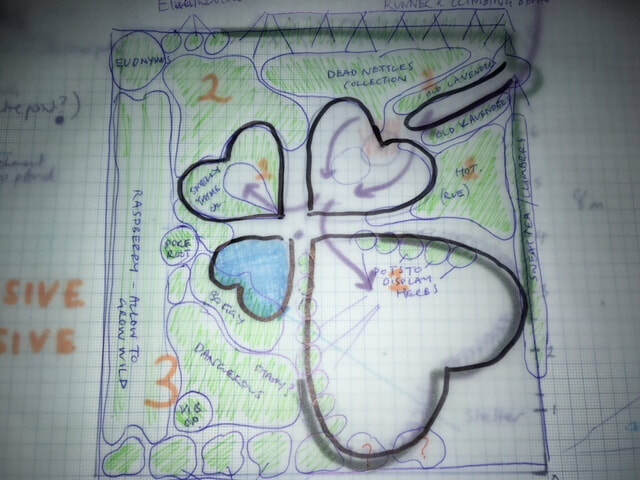 But with this magic garden (Herbahearts) blueprint I just need a square garden, in fact it could be adapted to any garden. I calculated a ratio to work out the proportioned heart sizes to the available space. Also the hearts could be rotated to suit the garden. Headings (hard to read) include Water, Fire, Earth, Air, Plants, Enclosure, Spirit, nooks, social space, greenhouse or shed? what materials?, entrance, aspect, amenities and User's thoughts & co-creation. Add LIFE! Its about placing the components into a new piece of land. Note the fancy drawing board....... I am now using for technical drawing. Client I'd most like to design for is a Newbuild GP Community medical practice. I need to create a garden for myself to work in with 10 by 10m space which can be added to the surgery designs being given to the builders. You'll have to wait for the HERBABOOK for design 13.